A climb through 300 steps and you get to the gorgeous Golden Mount. The temple is of course beautiful in itself, and as it is at an altitude, it exhibits breathtaking views of the entire city of Bangkok. The winding 300 stairs too, have their own beauty. There are trees to cover your path with beautiful statues and water works around. If you’re looking for a peaceful escape in the city, The Golden Mount is quite a recommended visit. 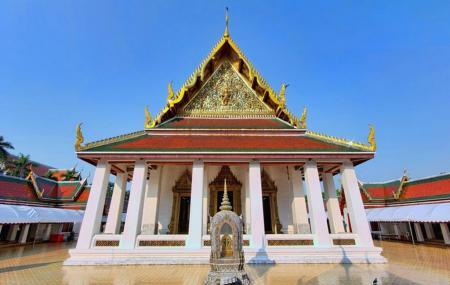 Also, visit the popular attractions in the city by following Bangkok itinerary 6 days. There is a temple fair held every November. How popular is Wat Saket? People normally club together Wat Benchamabophit and Wat Phra Kaew while planning their visit to Wat Saket. Great to start the morning during Bangkok tour. Gets very up top. Beautiful inside and views of the city at the top. Be sure to ring the bells and gongs!!! Plenty of refreshments at the bottom to quench your inevitable heat exhaustion.